Georgia summers are hot, humid, and sometimes unforgiving. During a hot, summer day all I want is something cold and refreshing. 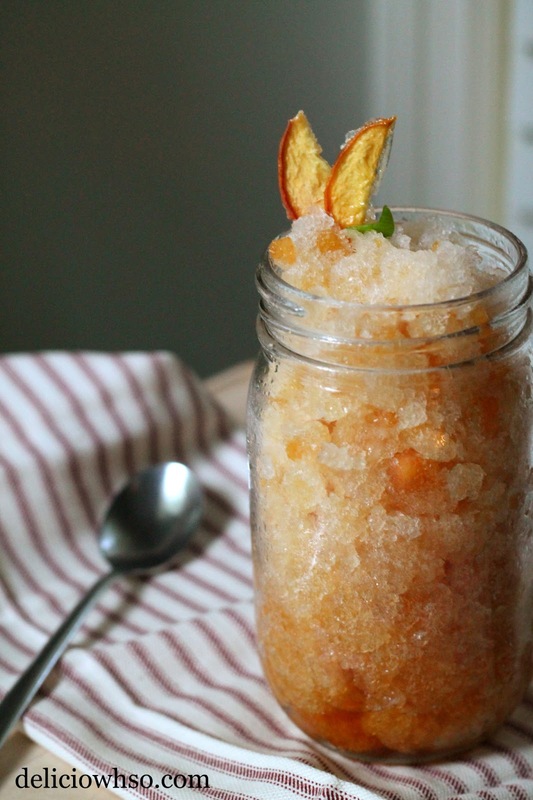 A peach tea granita does just the trick! It's made with southern style sweet tea and fresh, local peaches. This is a simple, elegant, and refreshing dessert that would be a hit at any party! But eat it before it melts! I love to include tea in my cooking, especially because it's not seen very often in desserts. It adds a slight bitterness that brings perfect harmony to a sweet treat! Here in the South, sweet tea is a staple, to say the least. I wanted to introduce this blog with something local, natural, and "me"- and this frozen dessert seemed to do just the trick! 1. Bring the water and sugar to a boil. Remove from heat. 2. Add peach slices to the hot liquid. Reserve a few slices to finely dice and put into the granita. 3. Steep your tea in the liquid for 10 minutes. 4. Strain into the freeze-safe container and add the cold water. Add diced peach pieces and stir. 5. Freeze. Run your fork a few times through the mixture every 20 minutes until completely frozen and icy. This will prevent the mixture from becoming a solid block to maintain a light texture. 6. When frozen, spoon into a cold glass and serve with peach chips or peach slices. 1. Thinly slice peaches to about 1/8 inch. 2. Place peaches onto a sheet pan with a silicone baking mat. 4. Bake at 200 degrees F until dry. Check if they are done by removing one from the pan and letting it cool. Try to break it (or just taste it). If it is crispy, it is done. 5. Remove from pan and shape as desired. If they are difficult to shape, put it back into the oven and let it warm up. If you do not want to shape them, just remove once cool. You may need a spatula if it sticks to the pan.